The desk starter kit is an essential kit to welcome a new hire without the hassle of hunting down basic desk supplies. 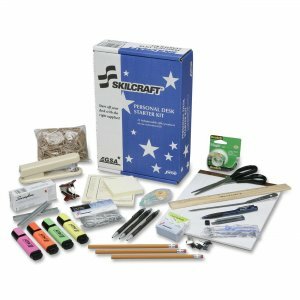 The kit contains 21 essential items: two message pads; 8-1/2 x 11-3/4" ruled, white Skilcraft writing pads; self-adhesive notepad; one bag of paper clips; one bag of rubber bands; one staple remover; tape dispenser with tape; one wooden ruler; one letter opener; three Skilcraft ballpoint pens; three No. 2 Skilcraft pencils; four Skilcraft fluorescent highlighters; white correction tape; one stapler; one medium, clam-clip, paper fastening system with refills; one 7mm mechanical pencil with lead refills; and scissors.